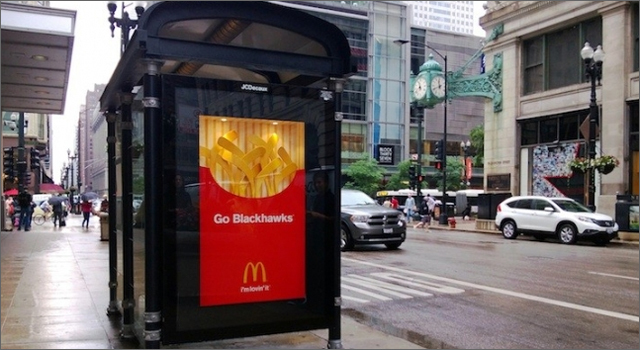 Ad agency Leo Burnett and the McDonald’s operators of Chicago and Northwest Indiana, unveiled a fitting tribute to the hometown Stanley Cup champions Chicago Blackhawks with a series of bus shelter displays featuring hockey sticks that looked like french fries. As part of the campaign the agency and McDonald’s will make a donation of hockey sticks to local youth hockey programs. Chicago’s PUBLIC Hotel, first opened in 1926 as the Ambassador East Hotel, was purchased in 2010 by Ian Schrager. Schrager spent $35 million refurbishing the hotel before re-opening it last September. It was the perfect opportunity to reward the couples with a room at the hotel, or dinners in the Pump Room and cocktails at the Library Bar. 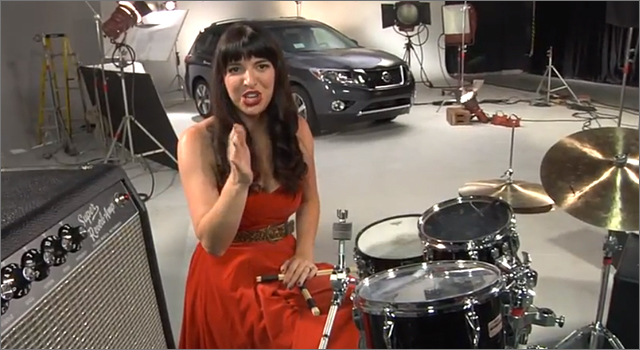 Up-and-coming bands doing co-promotions with major brands is becoming commonplace these days, and this past week Sharpie debuted their project with Chicago band California Wives on the 2012 MTV Video Awards. 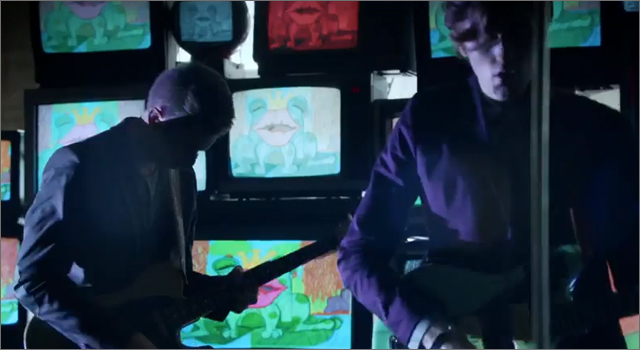 The video for ‘Purple’ features the band performing in front of dozens of monitors flashing the artwork that had been submitted to the Sharpie Gallery. Fans can use the Shazam app while watching the music video to get access to a free download of the song. Shortly after the video premiere, Sharpie launched an interactive site where fans could create their own mashup of the music video by uploading their own images at startwithsharpie.com. The project was created by the Chicago office of DraftFCB, and was directed by Ben Flaherty. In the hands of skilled and creative comedy minds, improvisation can produce magical unexpected results. And few do improvisational comedy better than the performers at Second City. 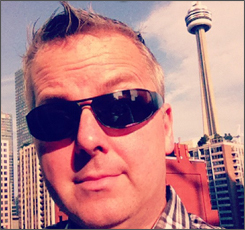 I’m lucky enough to work just a block away from Second City’s Toronto theatre, and have attended their Thursday night improv performances several times. Over the past 50+ years comedy legends such as Dan Ackroyd, John Belushi, Gilda Radner, Bill Murray, John Candy, Martin Short and dozens of others have developed their skills on the Second City stages in Chicago and Toronto. August 20 starting at 11am CST, present day members of Chicago’s Second City will perform live improvised music videos on the Nissan Pathfinder Facebook page in the ‘12 Hour Improv-tastic Road Trip‘. Visitors can offer suggestions and enter to win one of two trips to see The Second City in Chicago or Toronto. And, as for the connection between the Nissan Pathfinder and improvisational comedy? I have no idea. But, the press release mentions that it’s about next gen improv for the next gen SUV. This weekend marks the 20th anniversary of the first Lollapalooza festival, and the sixth year it’s been held at Grant Park in downtown Chicago. The 2011 edition includes acts like Eminem, Foo Fighters, Coldplay, My Morning Jacket, Muse and dozens of others. 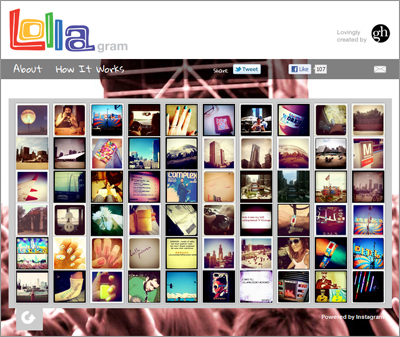 Chicago PR firm GolinHarris has created LollaGram, a nice little mashup application that ‘calls’ photos from Instagram. The application dubbed Lollagram searches from descriptions of photos that include Lollapalooza, Lolla or Lolla2011. YouTube will be offering two channels of performances from Lollapalooza starting tomorrow, check out the jam-packed schedule.